Do You have a LM season pass? I am going to get one at early bird prices in May 2019. Equus and Mister Tee on XC Skis like this. Fantastic! I can feel a trip coming on! Based on what the snow cams are showing , Tomorrow will be the best and possibly last day of skiing worth paying for at LM for 2018. Mt.BB got 13 cms overnight which means Mt.St.G. is back in the game for a few days. There were some remnants of snow on my windscreen this morning. The only indicator that it had snowed. A staff member just told me this morning that it was snowing in Narby at 7pm. I didn't even know. I got home at 6:50pm and was warming the house and feeding the dogs at 7. Have you ever had a year before like this one Teckel? I can remember some goodun's, I think it was in the 90's but not like this one. No, definitely my best in 14 years (since I opened). 2004 (the year before I opened) may have been comparable? Last year was good in that it went late (mountain open until the first weekend in October), but it also started late. This year started early and is finishing late. And some really good dumps - particularly 3 weeks ago. EquatorBunny and Mister Tee on XC Skis like this. Report from Sun 16th: Upper trails were fully covered & groomed (except for that patch between the lookout and start of panorama loop). Lower trails fairly good soft cover - could still ski from the carpark if you weren't fussy about some bare patches. Some light snowfall during the morning, otherwise overcast all morning. (Apparently yesterday you had to walk to the snow gauge). neilmny, Mister Tee on XC Skis, 2ESki and 3 others like this. I went for a quick surf at Ocean Grove today. The water was very cold. I had wet suit everything on except for gloves. I needed those!. See you all next year at LM. LM Obsessive and teckel like this. Beautiful, sunny day at Lake Mountain today! Thoroughly enjoyed it. Had a lesson to start with which gave me a focus for the day. Upper trails still good. Muster was patchy. Could this be it for 2018? What did you focus on in your lesson?. Felix and Gary are good people to have a lesson with up at LM. Step Turns are something I was working on last Tuesday while coming down The Paralyser, towards Rocky valley dam on the Bogong High Plains. I don't think LM can go on forever. If you love XC skiing ( I do ) then a trip to The Main Range in NSW in the next 3-4 weeks will be totally worth it. You can drive up in approx. 7 hours and car camp near Thredbo or at Island bend. Day 2 : ski all day. Day 3: drive home. If you reach Khancoban after dark then you can get a motel room there for about 80 clams. It is better not to drive up to Dead Horse Gap in the dark when you are fatigued. The Photo is from my trip out to the KNP in October 2017. There was still plenty of snow out on the track that goes from Charlotte pass to Seaman's hut. Yes, Gary was my instructor today. Like you, I also practised step turns. Additionally, I worked on basic skills. I’m only a little better than a beginner so there’s plenty of things I can choose to focus on! I was little better than a beginner this time last year . However by skiing A LOT during 2018 and in many different places and in the full gamut of conditions I am now a more confident XC skier. I can ski down/fall down ;-P Blue runs just about anywhere( but not The Race Loop at Mt. Stirling :-0 ) and I can ski up black runs/ herringbone up Black runs. I really enjoy XC skiing at Lake Mountain , it is not far away from Melbourne and it is fun. I do encourage people who are seeking to advance their basic skills as I have endeavoured to do this season , to ski the Green and Blue runs at : Mt. Stirling ; Mt. St. Gwinear ; Dinner Plain to Mt. Hotham; Mt. Buffalo; Falls Creek & Bogong High Plains; and the XC trails in the Kosci . N.P. . Next season I plan to ski the bowl at Camp Creek Valley out the Back of Mt. Bogong and some other real back country XC ski locations. Another handy thing to drill while you are XC skiing well on a flat area is skiing on one leg, a balance drill. I do that one too.XC skiing on groomed and ungroomed terrain is useful for improving one's XC skiing too. I like skiing on ungroomed back country terrain. Corduroy grooming is horrible to ski on when it becomes frozen solid. The very well fed woman must be yodelling now at LM. It looks like rock hopper city. "Early bird season passes for resort entry available until May 11. $157 early bird. $190 after May 11"
I don't think Brunnhilde yodels. 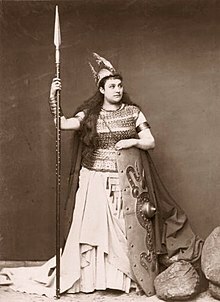 The late Anna Russell sent up German Opera by Wagner so very well. That she did, but that in no way detracts from Wagner. She was a fan of Wagner. As am I. And I have a CD of Anna Russell's send up. I have the original vinyl LP of Anna Russell's send up . I've just had a report from a local skier who said that it's only a 5 min walk up Home Trail to skiable snow. On the upper trails there is between 5 and 50cm of snow still. Occasionally a patch where skis need to be taken off for a brief walk. He described the surface as crisp to hard. By next week he figured it might be a 15 min walk, but still very skiable. So for those who are bemoaning the end of winter, get up there in the next week or so for a last hurrah. Have found this before - the ‘village’ being open (few trees) and lower often has a fraction of the cover of the upper, tree lined trails which have shade, snow entrapment & An extra 50-100 m working in their favour. And more good news - entry to the mountain is now free. The Keppel's hut track needs to be properly recut or it will become impassable within 24 months. Expect some big news for LM for next winter. Not sure I can divulge it yet. A cross country ski trail connecting Mt.Torbreck, Mt. Bull fight and the LM Hut Ruins ?If they cannot keep Keppel's hut track clear then anything else has no hope. DELWP's responsibility. Nothing to do with the resort. Maintaining low-use walkings tracks is low on the dELWP list of priorities, unfortunately. Wishing it wasn't so - but such work will always get effort 'Trumped' by fire-related activities. Which Is generally hard to argue against given recent decades? Perhaps PV should have a much broader range of lands /trails & budget?? The long anticipated Snow Factory. And a big one at that. Due for arrival in late March/early April. As well as a new pump station for the snow guns. The snow factory will enable guaranteed cover up to Helicopter Flat & maybe beyond. 2ESki and absentskier like this. Does the resort publish a profit and loss ? Did the season just gone produce a out of the ordinary result ? Would we ever know ? 2ESki and teckel like this. They would have done much better this year. And then they would have made a pretty packet from the Russel Crowe movie scene (another Ned Kelly movie) that was filmed there this year. We thought that Boundary Hut Site might have been considered for a revamp! Perhaps wooden balcony with deck chairs and umbrellas! Instead of day visitors, such as me , for XC skiing , just going up for a day , they could tow a sled out to the Boundary hut and snow camp out there with the hut to hang out in. There would have to be a drop loo installed too. Since the resort makes much of its money out of parking fees then having an incentive to stay overnight in the vicinity could be seen as a money spinner. The main rub would be that the Yarra Ranges N.P. includes that area so it is a Parks Vic. matter.